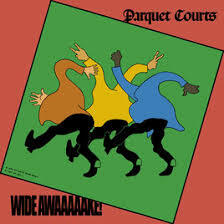 Parquet Courts is band with a huge work ethic. Albums under several names are shared with the world. The latest is Wide Awake!, an album where the band worked with Danger Mouse a.k.a. Brian Burton as producer. Those really in the know may be able to say what the effect on Parquet Court's sound is, I'm not expert enough for such a judgement. What strikes me in Wide Awaaaaake! is the pleasant way this NYC band uses the influences of this city, some from over 50 years ago and lets them land in a 2018 album, that sounds as relevant as it is urgent. 'Total Football' opens the album. A million influences simply are herded towards me. In the guitars, the melody, the singing, a pub quiz could be filled with questions just coming out of this song alone. And the fun fact? 'Total Football' is a fun song all by itself. Just take the start the album. Instrumental guitar strumming announcing a mid tempo song and then the song is taken into a totally different direction. The tempo changes, the mood, everything. And, yes, The Clash is all over the place, without making 'Total Football' sound out-dated for one second. Joe Strummer even seems to have been resurrected at the end when the intro returns to the song as an outro. Just listen to how the bass turns into the lead instrument of 'Total Football'. This is a way to start an album alright. I'm on my toes instantly and all ears. Something is happening here and I know exactly what it is to: great music! Ideas were tried out and at least several found themselves in the song. Now that I have played Wide Awaaaaake! several times, I'm starting to realise that I'm listening to one of the more relevant releases of 2018. All on this album seems to point at urgency. The choruses are meant to sing along to. In a way not unlike Dropkick Murphies' shout out to pub brawls, including loud singing to each other. "Powers of daily lives", alright. Again The Clash is brought to mind through the reggae-tinged rhythm. The organ takes care of the solo with ease. The bass plays the song home. Melodically not a lot happens on 'Violence', so to make the song interesting any way, takes an effort. Parquet Courts succeeds effortlessly it seems. As I find, each song that follows comes as a sort of surprise. The dull, yet fantastic 'Before The Water Gets Too High' is followed by the psychedelic, yet subdued pop song 'Mardi Gras Beads'. Again I'm listening in a sort of amazement how the songs develops with a great guitar part or two and a piano that pops up out of nothing. Only to be followed by the angry sounding punk song 'Almost Had To Start A Fight/In And Out Of Patience'. Wide Awaaaaake! is extremely diverse, yet coherent in its approach, making it a consistent album. That is in part in the way A. Savage and Austin Brown sing. Influences of a few 60s heroes and 70s U.K. (post)punk singers like Bob Geldof or Elvis Costello are never far away here. The huge choruses are a part of the sound also. Finally I like to mention Sean Yeaton's bass playing (once more). In nearly every song he has an important part. Not just keeping time and laying down the fundamentals, no always a part of the sound as a whole, distinctive. Wide Awaaaaake! is one of those albums that are worth while to invest your time in. Play the songs loud enough and the richdom of the music comes across even better. Party music for the mind? Yes, Talking Heads is in there to. Dance and think! Wide Awake!